I have a confession. When I put the Christmas decorations away, I never took any of my every day decorations back out. Which means, the shelves are bare. There’s no wreath on the front door or seasonal flag in the flower bed. Since spring is about new beginnings and sprucing things up, it is the perfect time to do a little redecorating. Last year, I refreshed my nest with things found in other rooms of the house. This year? I need to do a little more. But I am not quite sure what I want. That doesn’t mean I don’t have a little Pinspiration to help me out. I love these little topiary trees. I bought one last year at the Philadelphia Flower show in an almost similar pot. I should have bought 2 more! I used mine to brighten up my kitchen window. Now that I see three together, I think it would add a little more to the window sill than my lone tree. I really like how fresh this green and white combination looks! I really wish we had a mantle because I do have some white pottery that I could use. Next house! I need to get some apothecary jars STAT! I bought some lemons at Home Goods last year. I need to be on the look out for some limes and oranges. I love the color combination and it will look great on one of our bay windows. I would have never thought to take a cake stand and use it in this way! I have all of these elements already at home so this will be gracing my table as a centerpiece sometime soon! 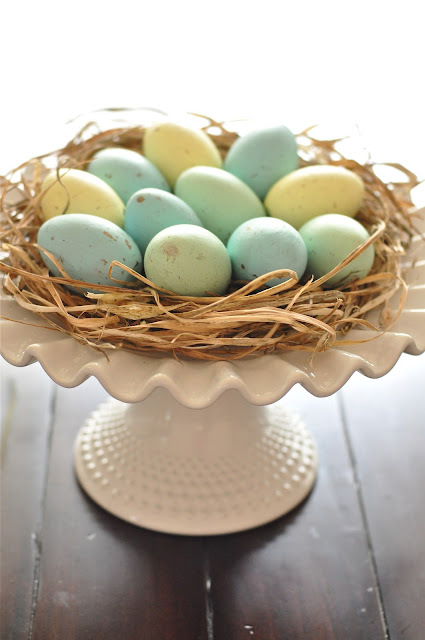 How do you refresh your nest for Spring? 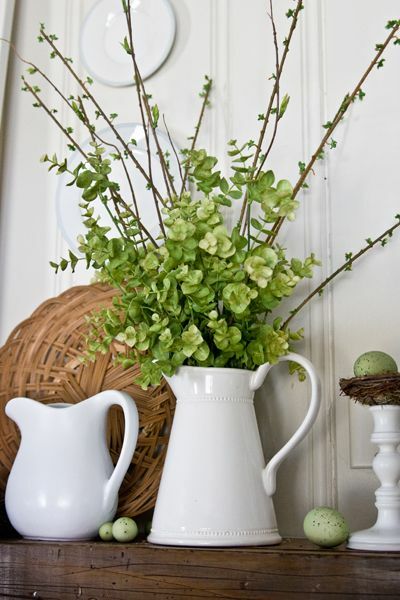 Link up your spring decor ideas below! I am totally uninspired right now. Le sigh. Oh how I love these ideas and pictures!